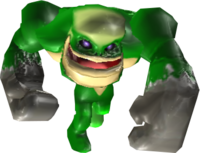 Greenfist is a humanoid reptilian boss that appears in Wario World. He is the boss of Greenhorn Forest, the first level. His arena consists of a single, small green platform. To beat him Wario must punch him enough times to stun him, then destroy one of his health skulls with a Piledriver, Wild Swing-Ding, or Mega Toss. He can also lose a health skull just by falling off the battlefield. Greenfist has just two attacks. In the first, he attacks Wario with a powerful slam from his fists that flattens Wario on contact. Wario must be standing right in front of Greenfist for the attack to connect. Greenfist uses his second attack after receiving some punches from Wario. He charges up and runs after Wario, flailing his arms wildly. This attack gets faster and thus more difficult to dodge as Greenfist loses health. It is also possible to deal two damage to Greenfist by using a Mega Toss and throwing him off the cliff, or Piledriving near the edge. After three powerful moves, Greenfist is defeated, coughs up a large amount of coins and Wario is allowed into Greenhorn Ruins. Greenfist is the first of the three bosses in Excitement Central. The Scythe-armed Monster is the second, and DinoMighty is the third. Wario in a boss fight against Greenfist. Greenfist is the only boss in the game to have three skulls instead of the usual five, therefore making it the weakest boss in the game. Greenfist and the Scythe-armed Monster are the only bosses whose names are never mentioned in-game. All of the other level bosses are mentioned by Spritelings in their respective levels, while the boss-only stages that the world bosses appear in are named after the bosses themselves. ↑ Stratton, Steve. Wario World Prima Official Strategy Guide. Page 24. This page was last edited on February 5, 2019, at 11:53.